Supreme Russel Rabbit Food Complete Muesli is a complete and balanced tasty muesli-style mix food suitable for rabbits of all ages: made with natural ingredients, it stimulates a rabbit’s appetite and foraging instincts, with a selection of ingredients ideally suited to keep it healthy and satisfied and full of nibble-ness. The finest quality alfalfa is included for fibre and calcium, and other vegetables provide the necessary protein, vitamins and minerals a rabbit needs. When feeding a muesli mix, you may find your rabbit is leaving their least favourite bits at the bottom of the bowl. 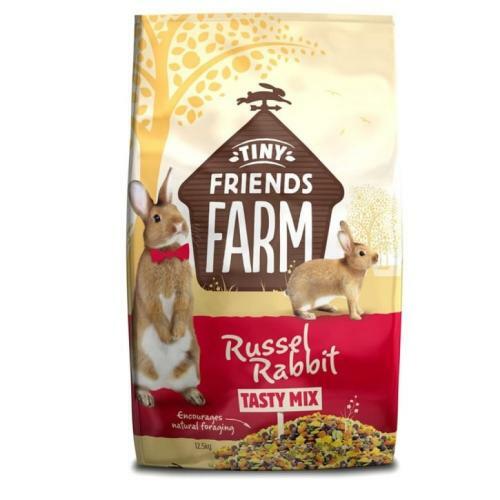 For your fluffy friend to be getting their full quota of essential nutrients found in Russel Rabbit, you should refrain from refilling their bowl until everything in their daily portion has been eaten, alongside unlimited fresh hay and water, and a small handful of greens. Changing your rabbit's diet to a new food couldn't be simpler. Over the course of no less than ten days, reduce their old diet by a fifth every two days whilst increasing their new food by the same amount, mixing both together in the same bowl. Alfalfa, flaked peas, straw, flaked maize, oats, wheat, flaked wheat, extruded locust beans, anise and fenugreek oil, soya oil, minerals, salt. Crude protein 14.0 %, Crude fibre 14.0 %, Crude oils and fats 2.5 %, Crude ash 5.0 %, Calcium 0.3 %, Phosphorus 0.4 %. Vit. A 10000 IU, Vit. D3 1000 IU, Vit. E 50 mg, Iron 50 mg, Iodine 0.40 mg, Copper 10 mg, Manganese 30 mg, Zinc 50 mg, Selenium 0.10 mg.